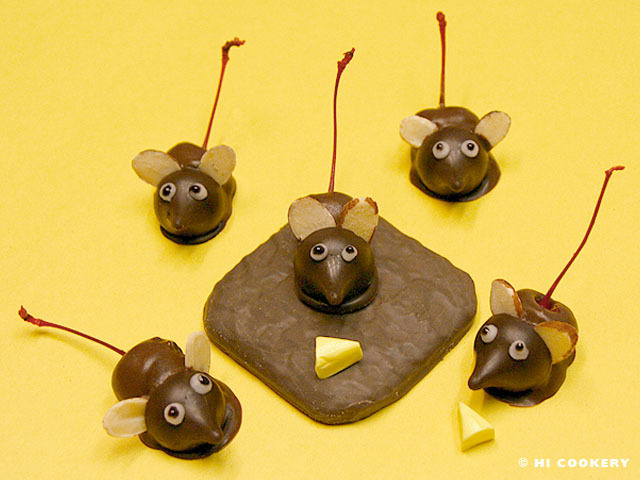 Check out these cheesy but cute critters: chocolate-cherry mice! Islander receives a lot of compliments when she gets creative with her cooking. She would study Internet images of funny foods and then adapt them with her own personal touches. 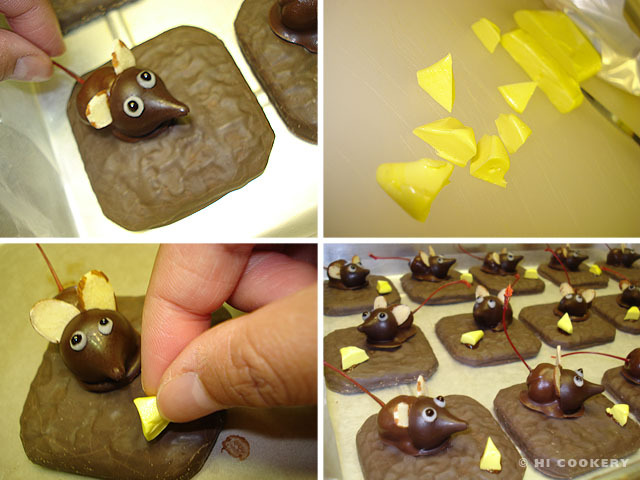 She made the mice by looking at basic photos, set them on a square base (chocolate cookie) and added a cheese wedge (made of yellow banana taffy). Our guinea pigs friends love them! Although chocolate-cherry mice appear as desserts around Halloween and Christmas time, they are also appropriate for Chocolate-Filled Cherry Day! Drain the cherries from its juice. Let them dry on a paper towel. Unwrap the Hershey’s Kisses chocolate candies and set aside. Melt the chocolate with a little bit of vegetable shortening until smooth. 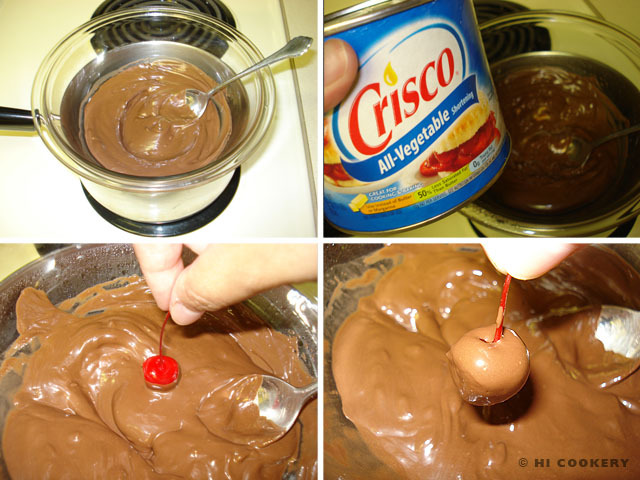 Carefully dip a cherry and coat it with chocolate. Set on a tray lined with waxed paper. 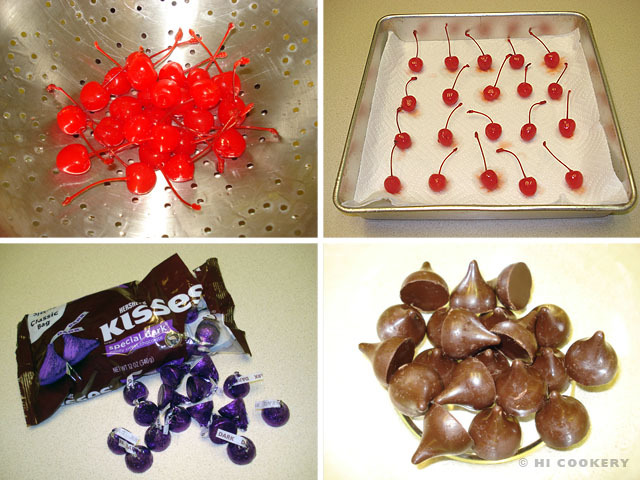 Attach a chocolate kiss to the cherry. 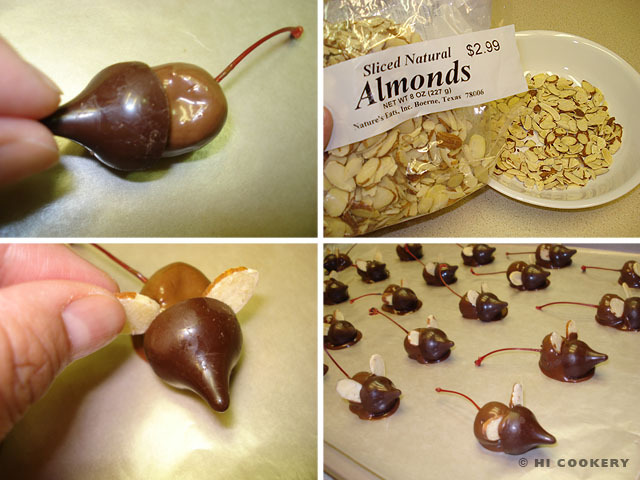 Dip the ends of two same-sized almond slivers in chocolate and attach between the chocolate kiss and cherry. Allow to cool. Continue making the rest of the chocolate-cherry mice in the same manner. Pipe little white circles for the eye balls using the vanilla frosting. Lightly touch with black gel to make the pupils and complete the eyes. Using a food-safe brush, paint the corner of a fudge graham cracker with the remaining melted chocolate. Attach a chocolate-cherry mouse on top of the fudge graham cracker. Using a sharp paring knife, slice of tiny triangles from the yellow taffy candy or fondant. 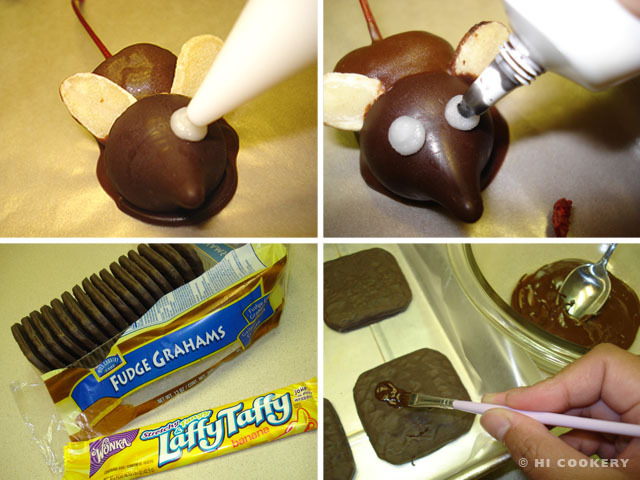 Paint a dot of melted chocolate to attach the “cheese” in front of the mouse. Refrigerate to set and until ready to serve. Substitute maraschinos for fresh, pitted cherries. your mice are o.k. but, i have a bakery near me who make the very cutest & almost life like mice, I’ve seen. I’ve scouted the internet & found some but, none as perfect as these. They look almost real. The girl at the desk told me, they were made w a lg.marsheno cherry w/ stem (for tail) and an almond mounted to it for the head/nose/mouth. cover in choc. It has aperfect mouse shape. I tried making them, & they looked “pretty good” but not great. Plus, they were only about half as big. Can you help me with this. I just love them. Thanks for visiting our blog. Our chocolate mice aren’t professional like the bakeries but our friends appreciate our efforts and sharing the treats with them. We have seen other chocolate mice get their realistic shapes from the cake ball technique (cherry enrobed in cake with an almond for its nose). You could try it that way and then dip the shape into chocolate and finish piping in the eyes and nose. Good luck and let us know how if your mice turn out okay as well.